Every year, around this time, I get this panicky feeling as I think about the summer slipping away. Wait! How can summer be ending? I didn’t have enough fun yet! I didn’t do all of the summery things I wanted to do! This summer more so than usual. I’ve been working overtime at work, on top of my super long hours. I spent weeks preparing for the party for my sister’s new baby. I started a food blog. Here’s what I haven’t done. I haven’t gone on vacation. I haven’t spent time in the beautiful outdoors. My skin is as white as it was in December. For me, it might as well be the dead of winter. Except for the barbecues. And oh what amazing barbecues I’ve made. Chicken, burgers, steak, veggies- everything. I like this recipe because it’s not straight off the grill- it’s a delicious use for your grilled vegetables. It’s a great side to a barbecued protein, or delicious cold the next day. Another great thing about this recipe- you can make this in the broiler during the long winter months, and close your eyes and pretend that you’re eating barbecued food. I’m including the exact list of the ingredients I used, but play around with the veggies you like. The possibilities are endless! Slice the zucchini and eggplant, toss with oil salt and pepper and grill until nicely browned. Allow vegetables to cool slightly, then cut into large chunks. Combine oil, honey, mustard, vinegar, salt and pepper together. In a medium bowl, toss together the rice, vegetables and dressing. Serve warm or room temperature. I know JUST what you mean about summer. Mine was also way too short and way too full of work. This is such an innovative dish. Bookmarking to try soon. This looks amazing,…definitely bookmarking to try. Thanks for stopping by and commenting. Please let me know how you like it! Hi, thanks for stopping by and for leaving a comment. I’ve got some more exciting rice ideas up my sleeve- stay tuned! Looks good! Hope you are able to get some vacation time in before the snow starts falling. 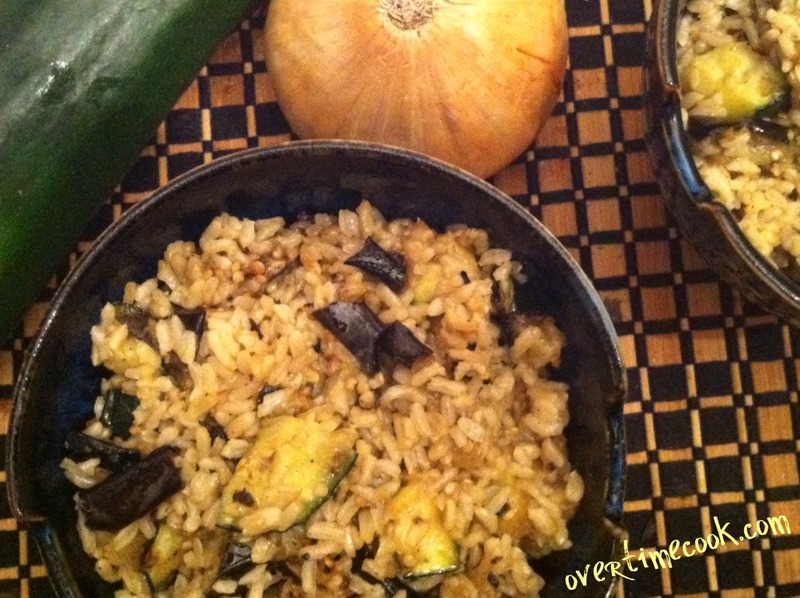 Vegetables are grilling….rice is cooking…looks delish! Thanks! Will be l’kavod Tom tov! hi, great blog! looking to make some things ahead of time for sukkot. can this be frozen? ?